The purpose of Internal Audit is to review and evaluate the effectiveness of our internal control process design and actual functioning on a day-to-day basis. Advantech requires Internal Auditors to check major operation processes, law and regulation compliance with objective manner and assist the board and management to reach their operating profit, performance and asset protection goals, as well as reasonably guarantee the reliability of financial reporting and conformity to related laws. 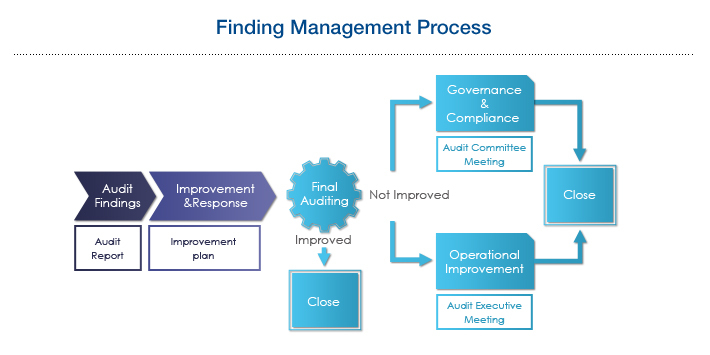 With the leadership provided by Board Audit Committee, Advantech’s Internal Audit function aims to go deep into the company operation process to identify the opportunities of further improvement. Special audit project is planned according to annual audit plan, which take into consideration of daily operation process, risk assessment and align with Advantech’s major strategies. The actual audit works may be adjusted per different functions, to review operating units across globally with same audit task or deep dive into operation process in all aspects for one region or one function. The major goal of Internal Audit is to build up a sound organization and operation mechanism to be the solid foundation and better support long term development of Advantech. Advantech’s Internal Audit function is an independent unit that reports directly to the Board Audit Committee. Internal Auditor is the business partner of all operation units in the company, assisting them to improve process efficiency, eliminate operation bottlenecks, engaging necessary resources and share the best practice among different business units with “LITA” spirit, to further improve Advantech’s overall operational efficiency. Major audit findings not been improved or corrected per schedule, the representatives of business unit will be invited to Audit Committee Meeting to explain progress and discuss improve plans. For those action plans related to company resource allocation, organization adjustment or modify of operation strategy, will be reported to the Chairman of Board to facilitate actions been executed and took place effectively. There are 4 full time employees dedicated to Internal Audit, including 1 director and 3 staff members.